Carnivore Specialist Rocky Spencer — Portraits, Corporate Storytelling, and Reportage Photography based in Washington, D.C.
Two weeks ago, I was hiking through the dense underbrush of Snoqualmie Tree Farm in East King County with Rocky Spencer, who worked as a carnivore specialist for Washington Fish and Wildlife. Rocky struck me as someone who relished every moment of his job. Last Saturday while watching the evening news, I discovered to my shock and disbelief that Rocky had been killed by accidentally walking into the blades of a helicopter. While I mourn his loss and the loss for his family, I do see how, personally, it is life-affirming. Rocky died doing what he loved. I can't think of any other way to live my life. Rocky Spencer had one of the most unusual job titles in all of state government: carnivore specialist. Spencer and his main co-worker, a dog named Mishka, searched the forests of East King County for evidence of cougars that roam in and around the suburbs there. 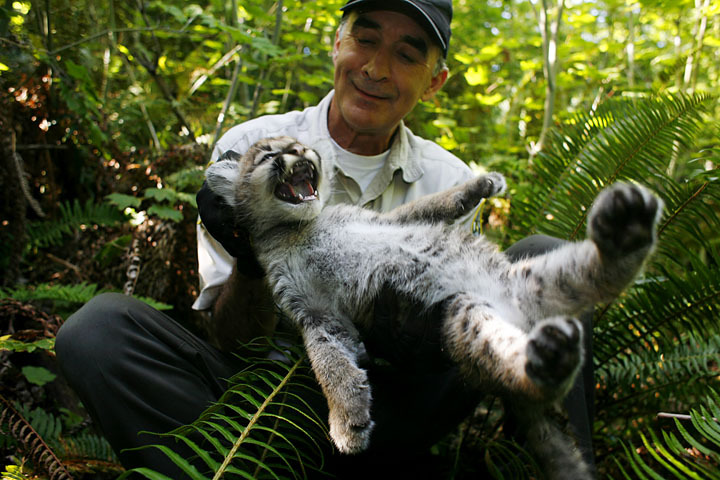 He and Brian Kertson, a University of Washington doctoral student, had been conducting the most in-depth study ever on the cougars that live alongside the state’s largest concentration of humans. Spencer, 55, was killed Saturday while working on a project to relocate bighorn sheep from the Yakima River canyon. He accidentally walked into the rotating blades of a helicopter that was sitting on a slope. At the time of his death, The Seattle Times was finishing a story about Spencer and his cougar study. His family felt the story should be published as a fitting tribute to a man who was dedicated to educating people about animals. Rocky Spencer grew up in Longview, where he graduated from R.A. Long High School. He earned a degree in wildlife management at Western Washington University and in 1978 began working with the state Department of Fish and Wildlife. "Rocky told me several times that he had the best job in the world," said his brother, Scott Spencer, of Castle Rock, Cowlitz County. "It wasn't a job. It was a lifestyle that became a career." Mr. Spencer also is survived by his stepmother, Adrienne Spencer, and two stepbrothers, Duke and Jeff Spencer.